Under the patronage of HH Sheikh Mohammed bin Zayed Al-Nahyan, Crown Prince of Abu Dhabi and Deputy Supreme Commander of the UAE’s Armed Forces, AbuDhabi will host the first conference for the development of a common Arab vision for digital economy from 16 to 17 December 2018. The conference, announced today “Wednesday” at the General Secretariat of the Council of Arab Economic Unity in Cairo, is part of the efforts exerted by the Council of Arab Economic Unity (CAEU) in developing a joint Arab action and harnessing the potential of the Arab World, to stay abreast with the major global changes in the digital economy, as well as bring together Arab capacities and international expertise to activate joint Arab cooperation for the advancement of Arab societies. The first edition of the conference aims at presenting the axes of the common Arab strategy for the digital economy to the attending representatives of the Arab countries, experts, think-tanks, academics and Arab and international practitioners. A number of international and Arab institutions and organizations and more than 70 International experts and specialists in digital economy are already involved in the formulation of the strategy. CAEU has established sub-committees with many international and Arab bodies including the United Nations, the World Bank, the organisation for Economic Cooperation and Development, the European Commission, the Digital Government Services in the UK and other institutions working in the digital economy to review the strategy before it is launched at the conference. The output of the strategy will include development initiatives and projects that will highlight the economic opportunities available for the Arab States in the areas of digital transformation. The context of the strategy is of non-compete and aims at integration to ensure that all Arab States benefit from the development opportunities. 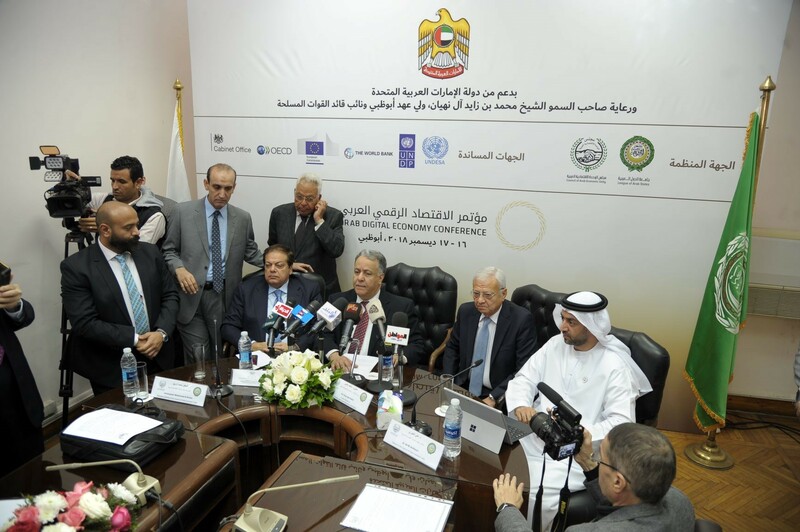 The announcement came during a press conference held at the General Secretariat of the Council of Arab Economic Unity in Cairo in the presence of Ambassador Mohammed Al-Rabea, Secretary General of CAEU, Eng. Atef Helmi, former Minister of Communications and Information Technology in Egypt and Dr. Ali Al-Khouri, Advisor to CAEU. Al-Rabea stressed the importance of the conference saying: “We had hope and ambition when we launched the Arab Common Market in 1964. Today the European Union has achieved what we had aspired for. The African Union is almost reaching a common African market. The Association of South-East Asian Nations (ASEAN) is at an advanced stage of unity, and we are still facing many internal and external challenges in the Arab world. Yet, we hope that the rise of digital economy can be seen as an opportunity and be leveraged to advance the Arab world”. “We have enormous potential, huge resources, geographical location and, most importantly, a generation that aspires to be the best. This generation is passionate about technology and has great potential to succeed in software engineering, electronics and disruptive technologies”, Al-Rabea continued. He added that: “The Arab Millennials have intuitive technology instinct. They will represent 75% of the workforce in 2025 with their global peers. We do not want this generation to be consumers, instead we want them to be producers, innovators, creators and pioneers in the fields of digital economy and play their role in the renaissance of Arab societies and nation”. “We are fortunate to also have the UAE, whose leaders today offer their expertise and achievements to support a common Arab vision for the digital economy, transfer its organizational and technological progress and successes in the fields of digital economy and transformation to the rest of the Arab states,” he added. Al-Khouri revealed that the conference will highlight the vast economic opportunities available for the Arab countries as a result of their digital transformation, stressing that many international investment funds are investing in the fields of technology in the Arab world, as well as huge opportunities for inter-Arab investments in the digital economy infrastructure. “The legislation and investment climate of the knowledge-based technology infrastructure will attract capital in ways that meet the objectives we want to achieve for the Arab societies”, Al-khouri concluded.